Many people tend to forget how important a case is when they build a new computer. Even gamers have the tendency to neglect this important aspect. The truth is cases should never be considered less important than any other component of a computer system. Gaming cases may be a little more expensive than regular computer cases, but this difference of price is fully justified. Spending more than five hundred dollars on a premium case may seem too much. But, try to ask any gaming enthusiast who has bought one already. The person will tell you that the case is amazing and that is very useful. This individual will tell you that the money was not spent in vain. When you buy a computer case, you have to choose well. You will surely use the case for many generations of hardware, so you can stay up to date with your computer and play the newest games. If you don’t know what to look for when you want to buy one of the premium gaming cases, you must become aware of the following characteristics: size, number of drives supported, the number of motherboards that are supported, the possibility to add water cooling equipment, side panel windows, high airflow, large interior, stylish design and many others. The story of Silverstone Temjin cases started in 2005, when the company released a case that seemed to be ahead of that time. Since then, with every new case that was released, SilverStone has brought something new: air duct design, 90 degrees mother board mounting and everything else that was needed for making gamers prepared for the upcoming generations of hardware. The new TJ11-BW has many new features, just as you can see below. Cooler Master Cosmos II is one of the best computer gaming cases that you can find on the market and some users say it is the perfect solution. This case is absolutely huge and comes with all the fans that you need for keeping your computer cool. The case is constructed from two types of metal: alluminum and steel. It has a design that is inpired from the design of race cars. For minimizing the clutter, wires go through the back of the motherboard area. Air flow is optimally facilitated, as the case is divided in two main parts: the upper part for the motherboard and the lower part for the power supply. Phantom 820 is just a newer generation of the known Phantom that adds more control and more features. This is a white and large gaming case with different large fans included and illuminated interior. NZX Phantom 820 has a smaller price than the first two gaming cases presented in this review. But, it still has many features that gamers will enjoy. There are two materials used for this product: steel and plastic. All form factors are supported, so you can put almost any motherboard in this case. The case has seven drive bays and nine expansion slots to meet different user requirements. One of the major features is the lighting design, which allows the user to choose from different colors. This gaming case is the flagship of the HAF series (High Air Flow) and can cool down the hottest computer systems. The case has a rugged militaristic appearance and design and includes all the functions and features needed for system management and cooling. It is focused on cooling not only motherboards and processors, but also graphic cards. 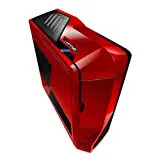 Storm Stryker from Cooler Master is one of the large gaming cases, it looks great and it has a rubber coated handle that allows you to carry it easily in case you need to. The carrying handle was built in an innovative way. The design is stylish and has two colors for the finish: black and white. There are different fans included, along with a windowed side panel and filtered covers for dust. This full tower case is perfect for gaming systems of any type. This is another case from the Phantom series and has a sleek design colored in white, with many options for expansion and cooling. Phantom 410 provides more value to the user than its predecessor. You can easily replace HDD’s for this gaming case. Two materials have been used for making it: steel and plastic. This is the cheapest solution of all that are presented in this review, but it is still full of features.